As the countdown continues to Indonesia’s elections, foreign policy is among the areas that outside observers will be looking to get a sense of. On this front, however, it must be said that the two contenders’ foreign policy outlooks have not really factored heavily into the campaign all that much beyond a series of tendencies. While that ought not to be that surprising, it nonetheless warrants attention. Even before the campaign began, the extent to which foreign policy would matter in the election was already expected to be quite circumscribed. For one, more generally, the extent to which foreign policy actually matters in any election, including Indonesia, is a contested question in and of itself. For another, the last presidential election, which saw a contest between the two candidates in Joko “Jokowi” Widodo, now the incumbent running for reelection, and Prabowo Subianto, who lost, foreign policy mattered in terms of highlighting some key issues and indicating a difference of worldviews and styles – with Subianto perceived as being more assertive and hardline than Jokowi – but the race was not really determined in terms of where candidates stood on specific foreign policies. This time around, if anything, that tendency might be said to be reinforced. The incumbent, Jokowi, was expected to lay out a case for continuation of current foreign policy, and he has been far from a foreign policy president unlike his predecessor Susilo Bambang Yudhoyono. That foreign policy has not been as central to Jokowi’s time in office means it offers less potent of a place of attack for the Subianto camp. And that has indeed been how it has played out. A case in point was the debate on foreign policy both candidates had a few weeks ago. Again, in such elections, it is important to emphasize that debates hardly set hearts aflame. 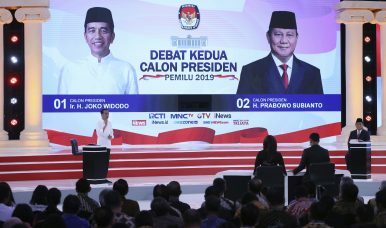 With unclear evidence debates really assist swing voters in making a choice and criticisms that landing jabs is more important than talking policy, Indonesia’s previous three debates have been more fodder for social media users than political blockbusters. Nonetheless, the debate reinforced both the place of foreign policy in the election and where both candidates have stood. Jokowi held his line laying out a case for continuation of current foreign policy, while Subianto tried to come across as different enough by emphasizing where his more aggressive and nationalist view might make him a better choice. Jokowi’s areas of focus were not surprising. They directly addressed, touched on, or flowed from some of the areas that he has developed during his tenure, including a foreign policy focused on addressing domestic needs first and foremost, highlighting the role of traditional aspects of Indonesian leadership in the region and the Muslim world – including solidarity with respect to the Rohingya – and securing Indonesia’s interests and sovereignty. He steered clear of addressing the persecution of China’s Uyghur Muslim minority so as to avoid bringing China into the conversation, and he highlighted his administration’s securing of economic deals and benefits from other countries. Subianto’s areas of focus, similarly, amounted to more of the same. A former military man, he put the focus on issues such as increasing funding to the Indonesian military, pointing to Singapore’s annual defense expenditure as being so far ahead of Indonesia and indicating neglect on this front under Jokowi. And he kept going back to a theme he is fond of emphasizing – Indonesia is “disrespected” by international peers: including because it is an economic basket case because of with a weak rupiah and high public debts. He belittled current foreign policy as acting “as a mediator and a nice guy” while Indonesia was actually being disrespected. “If diplomacy is based only on smiles, just being a nice guy, then how can we defend our interests. If people come into our country, what will we do?” he said. Ironically, Subianto’s framing of the debate on foreign policy, including the “nice versus not so nice” distinction, only reinforces the current tendency to focus on styles and tendencies, rather than actual policies. While there is still time left till the election, it seems unlikely that the foreign policy debate between the two candidates will actually get to a more granular level. A viral hashtag could represent an early indicator of what to expect as Indonesia heads to the polls next year.